for the purposes of exercise and recreation for the inhabitants of Oxton. adjacent to Oxton Cricket Club's pitch. The area is accessible 24/7 to any member of the public. development plans were completed in one fell swoop in summer 2011 when all the necessary grants and community donations came in. The created a new adventure trail zone and upgraded toddler area integrated into a bigger, better play area for a wider range of ages and abilities and to bring different generations of the community together. The rest of field area being badly affected by moles and rabbits, had been left over the years for informal activities and dog walkers. The popular village bonfire event is also held annually on the field. Phase 3 efforts were therefor to create a levelled, re-grassed multi-use area approximately 70m x 50m by summer 2012 (Village Plan Project 10a). Following Parish Council funding approval in November 2011 and the associated works, this stage is now complete. So, folk now have a fit-for-purpose area for exercise, informal sports practice and community matches from football to rounders etc, whilst still leaving space for other uses. The Parish Council have also provided 3 picnic tables which were installed in summer 2012 (Village Plan Project 21) near the new playspace facilities, as requested. 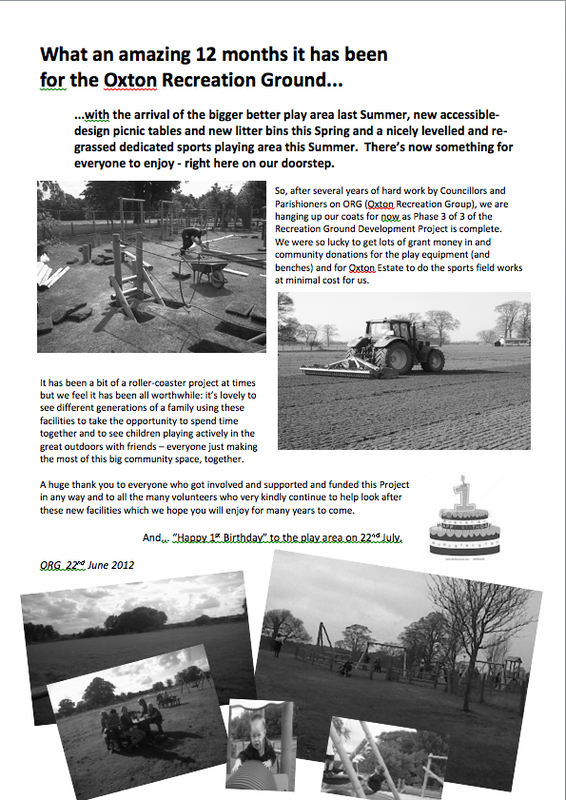 For further project background information, please visit the Recreation ground project website.